Turquoise might just be the most beautiful shade of blue that there is. It is reminiscent of mermaids with pretty blue eyes and the entire sea for them to roam. The ocean’s greatest treasure is the lovely greens and blues that inspire us so much. These DIY jewelry ideas are all little mixtures of aquas and sea greens. In other words, we have turquoise jewelry for all tastes here. You can learn how to make pendants that capture the beauty of the ocean and you can find DIY beaded jewelry for nearly any occasion. Don’t be afraid to open this treasure chest of tempting turquoise jewelry. All the riches of the sea can be yours with these easy tutorials and jewelry inspirations. Dive in to the big blue world of turquoise accessories and discover why we love this cool shade of blue so much. When I was younger, my favorite color was blue. Now that I’m getting older, I am beginning to love green more and more. Turquoise is the perfect way to reconcile my old and new color preferences. I hope you enjoy these lovely pieces of jewelry as much as I do. Learn how to make beautiful blue bracelets to slide upon your wrist with these two cute DIY bracelet ideas. Pull up your hair and adorn your ears with these beautiful earring ideas. 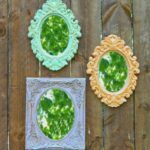 Your friends will surely turn turquoise with envy once they see your new DIY accessories. My personal favorite? 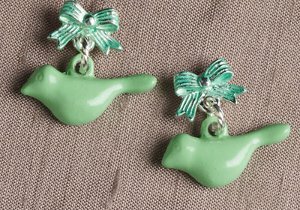 The Teal and Turquoise Earrings that look like adorable birds! If only I had my ears pierced, I would create them in a heartbeat. 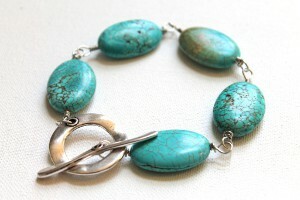 If one turquoise accessory just isn’t enough, try creating an entire jewelry set for you to enjoy. These blue beaded beauties will ensure that you look like the belle of the ball. 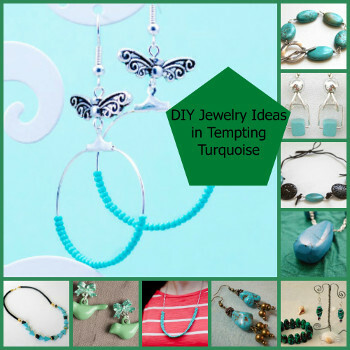 Dress up any outfit with some homemade turquoise jewelry, and all eyes will be on you. Don’t forget to show the world those pearly blues! 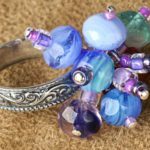 With these extra 145 Jewelry Making Ideas, you will find everything from friendship bracelets patterns to DIY hair accessories to hemp bracelet patterns. What is your very favorite shade of blue? Summer is fast approaching, and braided bracelets and necklaces are staples of the season. Braiding is one of the most basic ways to weave, but if you think braids are boring, think again. Simple yet intricate, braided patterns are a classic fashion motif for a reason, and there are so many ways to work this weave into your accessories. Embrace the braid with these 35 Braided Jewelry Patterns! Learn how to kumihimo, fishtail braid, box braid, and more in this collection of lovely braided jewelry project tutorials. Braids are the best for the summer season because they usually do not require a large amount of materials, and rarely require any tools. 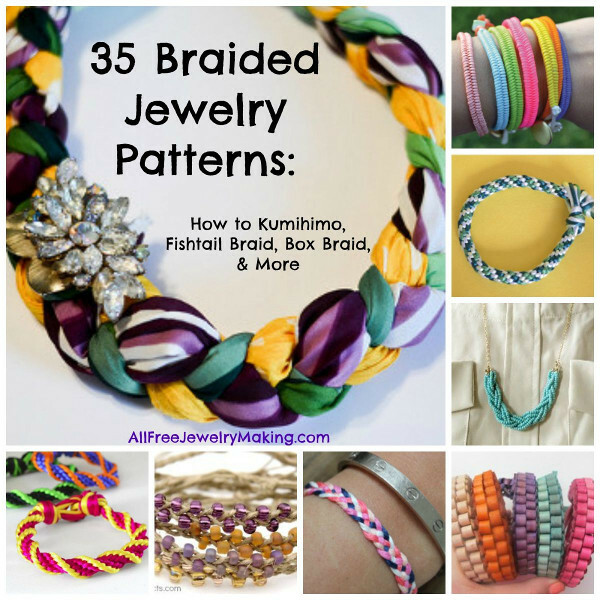 From trendy kumihimo patterns to fan-favorite fishtail braids, there is something for everyone in this collection of fabulous braided jewelry patterns. Kumihimo is a beautiful Japanese braiding technique that has become incredibly popular of late. Once you check out these projects, you’ll understand why. Also known as the “square braid” or “square stitch,” the box braid is sturdy and strong yet stylish. Learn how to box braid by making these macrame jewelry patterns. 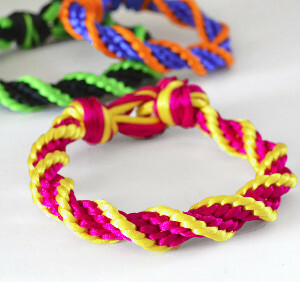 The fishtail braided bracelets are sure to be fan-favorites. This style of braid is a fast and fashionable way to weave. Follow these tutorial to learn this fun braiding technique. What is better than a simple braided jewelry project? A projects with braids and beads, of course! 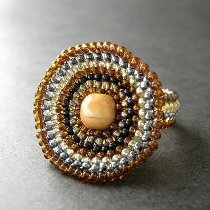 Beaded designs are easy to replicate and can be endlessly customized using different colors, sizes, and cuts of beads. These braided jewelry designs are a great way to use some scrap fabric, a secondhand scarf, or an old T-shirt. For accessories on the softer side, try braiding fabric into a trendy bracelet or necklace. Looking for some thrifty braided jewelry projects? These hemp, cord, and embroidery floss jewelry projects should all be pretty cheap to make (which means you can make even more of them!). 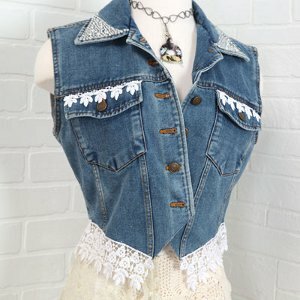 What’s your favorite braided jewelry pattern technique? 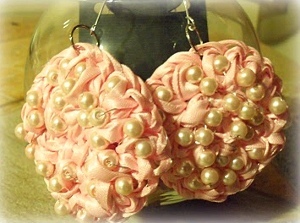 Looking for new ideas for accessories and embellishments? 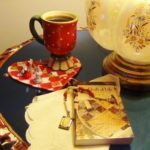 Then Fun with Chinese Knotting: Making Your Own Fashion Accessories & Accents from Tuttle Publishing is for you. Enter to win the Fun with Chinese Knotting Book Giveaway! 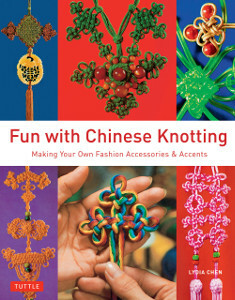 We are giving away one copy of Fun with Chinese Knotting from Tuttle Publishing to one lucky winner. The deadline to enter is May 26, 2014, at 11:59:59 p.m. Eastern Time. Bright colors, beachy designs, light fabrics, the smell of sunscreen in the air—it’s almost that time of year! These are all essential elements of summer style, and the season will be here before we know it. As the weather warms up, you’ll need fun and exciting accessories to create a hot summer look. 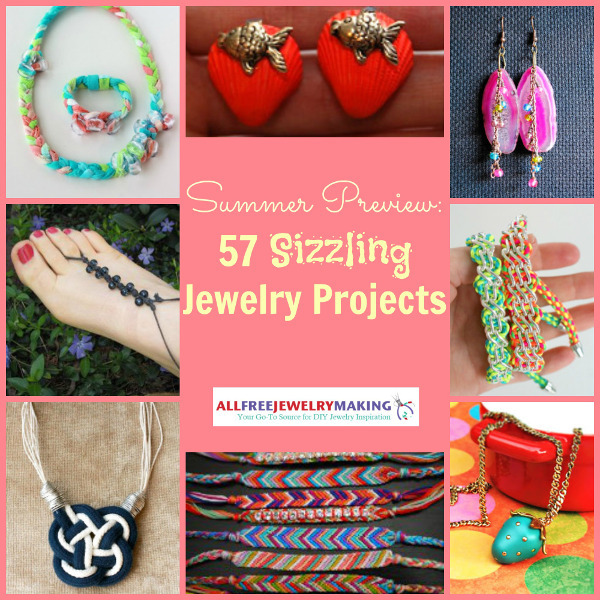 We’ve got you summer goddesses covered with this collection of 57 Sizzling Summer Jewelry Projects. From bold neon bracelets to trendy nautical necklaces, we have a little bit of everything you could need in this seasonal assortment of DIY jewelry. Whether you are vacationing by the beach, or lounging by the local pool, there is something for everyone in this collection of sassy and stylish summer accessories. 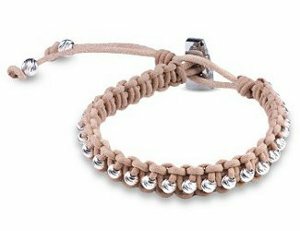 Of all the bracelet patterns and instructions out there, the Studded Leather Macrame Bracelet is sure to become a fast favorite of yours. This super cool bracelet design uses sterling silver beads and shamballa knots to create an edgy studded effect. Macrame and friendship bracelets are staple accessories of summer. 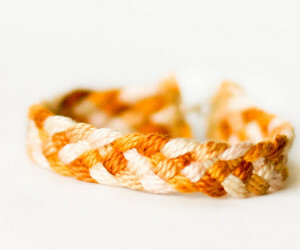 To find other bracelet patterns like this fun macrame bracelet, visit our collection page. Summer is the season of bright and bold colors, especially for jewelry pieces. 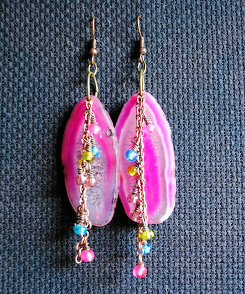 These bright pink Summer Agate Dangle Earrings are a product of one of our simpler beaded earring tutorials, and they are sure to send lots of compliments your way. Check out our summer jewelry collection for more colorful summer jewelry projects. Warm weather is wonderful, but when it’s hot out, you don’t want to be worn down by heavy materials. Keep cool and look hot with light and airy summer jewelry patterns. 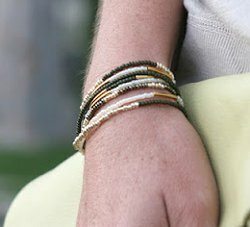 Whether worn stacked or singular, these Dainty Stackable Seed Bead Bracelets make the perfect sophisticated accessory. 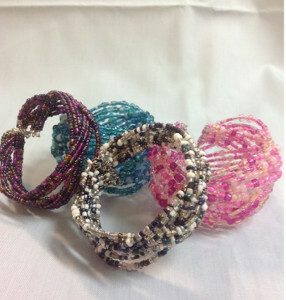 This handmade seed bead bracelet set would be the perfect finishing touch on almost any outfit. 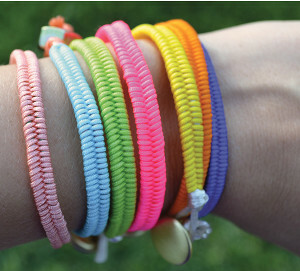 You can’t go wrong with these cute summer bracelets. Find even more light and airy jewelry patterns for in our collection for summer. Going to the beach is one of the best summer activities there is. Want to hit the sand and still make a statement? 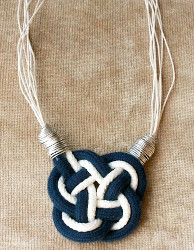 Then you will want to try beach-ready pieces like this Nautical Knot Necklace. Sea-faring fashionistas are sure to find summer jewelry pieces they love in this group of beach-worthy projects. If you still haven’t seen the right summer jewelry accessory for you, don’t fret! We have even more summer projects for you to choose from. Remember, we are always adding projects to AllFreeJewelryMaking.com, so be sure to check in for the latest seasonal projects and trends! What is your favorite summer jewelry piece? BONUS: This collection features several knot and macrame bracelets. Want to expand your skills in these areas? 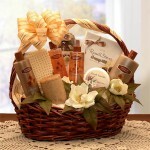 Enter to win the Leisure Arts Knots and Macrame Book Giveaway! 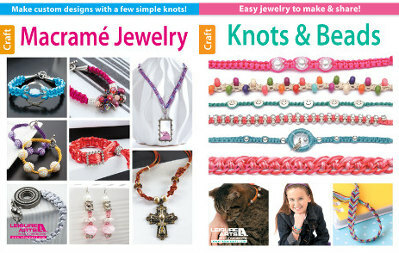 We are giving away a copy of Macrame Jewelry and Knots & Beads to two lucky winners. The deadline to enter is May 12, 2014, at 11:59:59 p.m. Eastern Time. Want to make stunning DIY jewelry pieces? You cannot go wrong making jewelry with gemstones. You’ve probably heard that diamonds are a girl’s best friend, but any homemade jewelry piece made with a gemstone is sure to be a favorite in your collection. A gemstone or gem is a piece of mineral that, when cut and in polished form, is used in jewelry making. Both precious and semi-precious gemstones are classified into different groups, species, and varieties. What they all have in common is that they are wonderful components for making gorgeous jewelry. Many gemstones have been making a comeback in popularity lately thanks to celebrity engagement rings like Kate Middleton’s stunning sapphire ring. You don’t have to be a royal to add gemstone pieces into your jewelry collection; there are plenty of budget-friendly, homemade jewelry projects. That is why we at AllFreeJewelryMaking have compiled this list of wonderful DIY jewelry projects with gemstones. 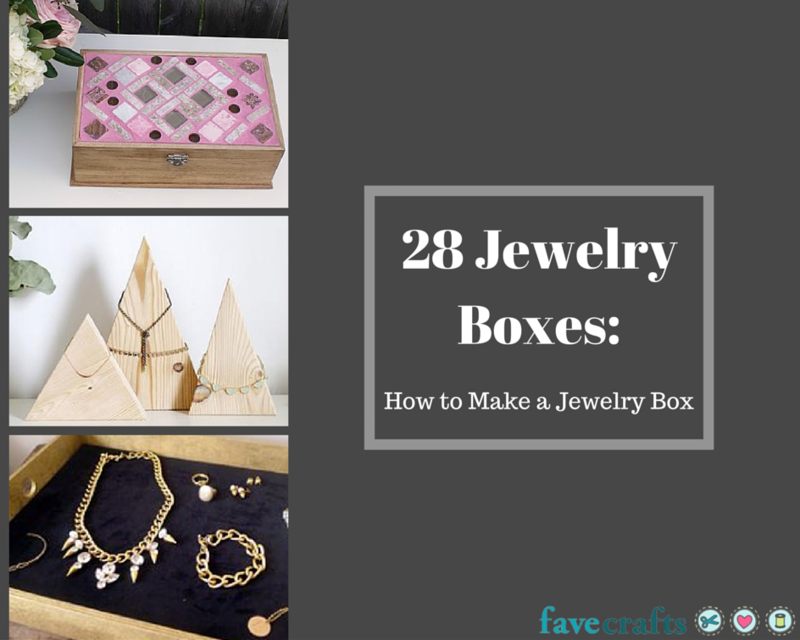 Enjoy making these beautiful, trendy, homemade jewelry pieces! One way to incorporate gemstones into your DIY jewelry collection is with homemade bracelets. 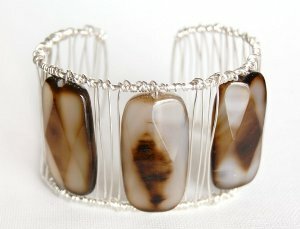 A great option to start out with is this Wire-Wrapped Agate Cuff Bracelet. Learning how to make bracelets can be intimidating, but there is no reason to be nervous about getting started when you try this wonderful bracelet pattern for beginners. Not into wire-wrapping? Try a Jasper Stone Bracelet or a Hematite Slab Bracelet instead! 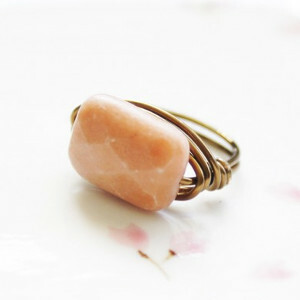 Make a gemstone ring that is both elegant and versatile like this Wrapped Peach Aventurine Ring. Aventurine is a type of quartz that gives off a glistening or shimming effect, and this DIY ring is sure to be a shiny standout. Need an even shinier piece? Try a Bright Bling Ringlet. If you are in need of a little less bling, a Stone Cap Ring is another great option for a DIY jewelry project. DIY earrings are always an awesome way to start incorporating a new type of jewelry into your collection. Make glamorous earrings like these Enchanting Emerald Earrings to make your friends green with envy over your sparkly jewels that have a budget-friendly prices. Even simple studs can be made more alluring when a gemstone is added, like with these Carnelian Dotty Post Earrings. 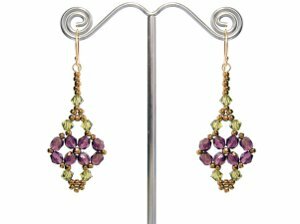 For more homemade earrings featuring gemstones, try the earring patterns below. Looking for a set of matching jewelry pieces featuring gemstones? Try a burst of red with a Red Jade Bracelet and Earrings Set, or add a dash of green to your outfit with this Jade Floral Jewelry set. Still haven’t found the right piece of DIY gemstone jewelry for you? 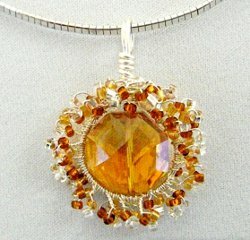 Visit AllFreeJewelryMaking.com to find more gemstone projects. Are you loving the Enchanting Emerald Earrings? It’s your lucky day. You have a chance to win AllFreeJewelryMaking’s Enchanting Emerald Earrings Starter Kit Giveaway from Bettina Johnson Jewelry! Read our review of the Enchanting Emerald Starter Kit. Enter by December 2, 2013 to win! The 1920s are all the rage these days! The premiere of a new film adaptation of The Great Gatsby this year has ushered in a revived desire for Jazz Age-inspired jewelry. I don’t know about you, but I was so excited for the new film version of this classic American novel. The movie was certainly an audacious spin on the material, and it excited many admirers of the novel. Designers have also been excited and influenced by the film’s era, and looks galvanized by a love of the Jazz Age, flappers, and art deco have appeared all over fashion magazines and red carpets. Vintage jewelry pieces, in particular, are very popular. You don’t have to bust your budget on expensive, vintage jewelry pieces; get these 1920s-style looks for less by making DIY jewelry. 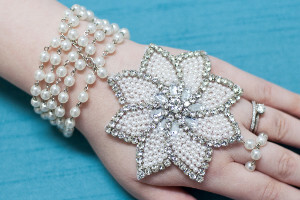 AllFreeJewelryMaking has compiled a list of 1o vintage-inspired crafts to meet your 1920s-inspired fashion desires. 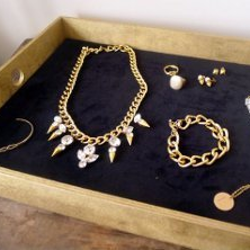 To get Great Gatsby inspired style, start off your DIY jewelry making with a statement piece. 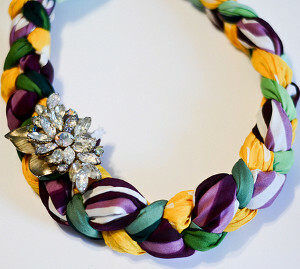 Try a homemade necklace, like this Multistrand Bugle Bead Necklace. 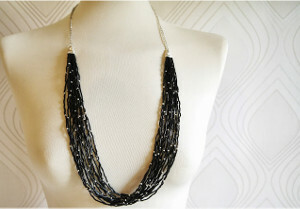 This tutorial will show you how to make a necklace with so many strands with ease. You’ll have a necklace worthy of flapper wear in no time. Below are other DIY necklaces you can try to fit right in with the Jazz Age. The simplest way to add some vintage-inspired DIY jewelry is with homemade earrings. Art Deco style was huge in the 1920s, and you cannot go wrong with these Deco Darling Earrings. The gorgeous geometric design in these earrings recalls the bold Art Deco style of the ’20s. 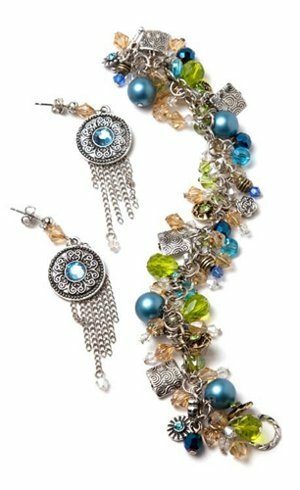 If you aren’t as into Art Deco but still want to rock a Great Gatsby-inspired look, try this Jazz Baby Gatsby Inspired Jewelry for another homemade earring project. Flappers are a staple symbol of the 1920s. 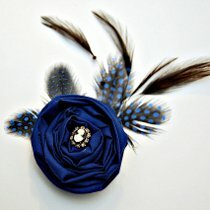 If you’re looking for something to add a little excitement to your outfit for Saturday night, try making this Royal Blue Flapper Hair Clip. Try these other flapper-inspired jewelry pieces for your hair, put on your dancing shoes, and you’ll be ready for a night out on the town. Like most jewelry of the Great Gatsby era, these DIY jewelry pieces evoke eras of the past, with a modernized twist. This Great Gatsby DIY Bracelet from M&J Blog was inspired directly by a piece of jewelry that Carey Mulligan’s Daisy wore in the film. This homemade bracelet is stunning and very bold; if you are looking for some sparkle but something a little less flashy, try this Sparkle and Stardust Bracelet. The opulent effect of multiple stacked bracelets makes this one show-stealing piece. So get into the Gatsby spirit this season and try these fun, vintage-inspired DIY jewelry pieces. Looking for more vintage-inspired jewelry to make? 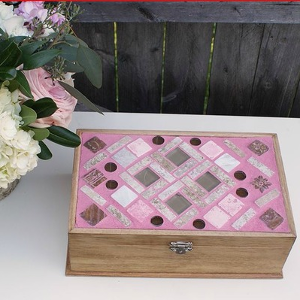 Find DIY jewelry projects from every era in 15 Vintage Jewelry Patterns. Would you wear these 1920s-inspired accessories? Doesn’t winter feel like it’s been going on forever? Though spring technically rolled in on March 20th, those winter blues may be still nagging some of us. Don’t worry; at AllFreeJewelryMaking, hope springs eternal. 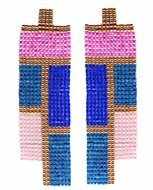 Battle the blues by checking out and trying out Beader’s Digest: The 34 Prettiest Beading Designs and Patterns You’ve Ever Seen. Every one of these dynamite DIY jewelry designs is a remedy for the old melancholia. Just because nature is taking her sweet time getting gussied up for spring doesn’t mean you have to. These DIY jewelry designs manipulate beautiful beads into different bracelet, necklace, ring and earring designs. 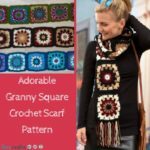 These are beading designs and patterns that are positively lovely. The tutorials featured in this collection of jewelry designs will equip you with the skills to spring forth from any lingering winter blues. Step into the new season with a refreshed attitude and awesome accessories to boot. Yes indeed, ladies and gentleman, our antidote to being down in the dumps will surely revitalize you. If you’re in doubt, here’s a little sample of our prescription. 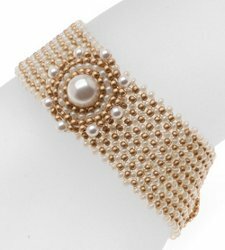 We recommend bed rest and beading bracelet designs to lift your spirits. These DIY bracelet patterns are a great way to relax and enjoy some “you” time. In these bracelet beading designs and patterns, you’ll find various ways to make a bracelet. 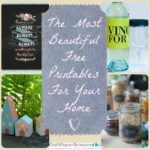 Whether you’re fond of stitching or stringing you’ll find a project in this collection that will pep you up. Take this Grace Kelly Woven Bracelet, for example. The name itself is enough to make you smile, let alone the intricate stitches that make up this bracelet. If you want to brighten up your day, learn how to make earrings. I always find earrings that I want to buy, but grumble at the price. 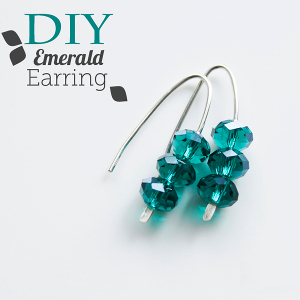 These easy earring patterns put an end to the grumbling. I found these Victorian Flaire Earrings particularly striking. 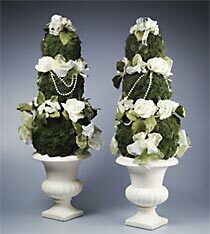 They look identical to something I’d see at a boutique. Make these DIY earrings, and any of the featured beading designs and patterns, for a fraction of the price you’d find in a store. I can’t help smiling at that. 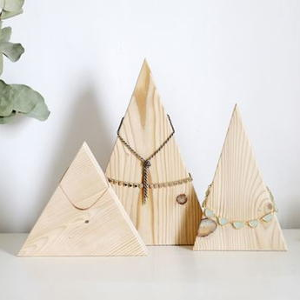 DIY necklace designs are an excellent way to feel like a new woman. 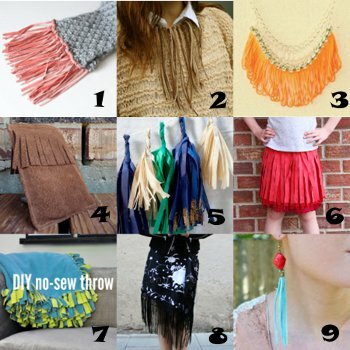 If you make any of these featured necklace crafts, you can transform an outfit from glum to glam. I’ve pulled this Lilac Rosette Seed Bead Necklace from the collection of Beader’s Digest: The 34 Prettiest Beading Designs and Patterns You’ve Ever Seen to show how seasonal these crafts can be. 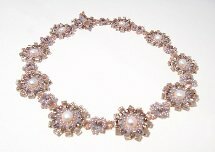 Note the beautiful lilac color in this floral-like necklace pattern. 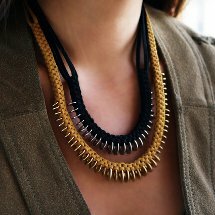 It’s the perfect DIY necklace to herald spring. 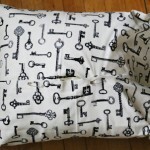 Our final remedy for you is this collection of DIY ring patterns. These are my personal favorites. A ring can go a long way in making you love your look. Plus, it’s an excuse to get a manicure. I wanted to sharpen up my stitching skills and found I could from this Circular Brick Stitch Tutorial. These are so much fun to make and look great. The answer to a refreshing attitude lies in Beader’s Digest: The 34 Prettiest Beading Designs and Patterns You’ve Ever Seen. If you try out these jewelry designs you’re going to like the way you feel; we guarantee it. Do you have a favorite piece of spring jewelry? 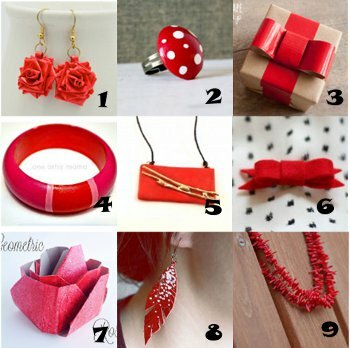 February is all about the color red. Of course there’s Valentine’s Day, when red hearts, red candies and, well, red everything rules. February is also American Heart Month, a time to raise awareness about heart health. Throughout the month, there have been a variety or events and opportunities to spread the word about heart disease. Wearing red was just one of many options and people all over the world took advantage. Before February ends, make a red craft (or two) to capture the essence of the month. 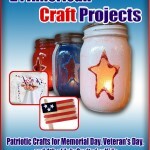 In a previous blog post, AllFreeHolidayCrafts editor Jennifer showed off some of the top red crafts from that site. Today, we’re widening the scope and going beyond holidays – we’re talking red crafts for every season! During the long, cold winter months, a Knitted Brim Hat and a Bright Red Shimmer Cowl are great accessories that will stand out from a sea of black clothes. 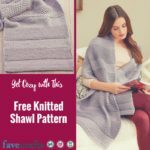 These patterns show that your wearables don’t have to match the cold and gray weather outside your window! If you’re not interested in yarn crafts, use a red shirt to create a dress or red cardstock to make a handmade card. Get inspi-RED and create some bright crafts that will capture everyone’s attention – it’s a great way to beat the winter blues!